This book is an incredible work of artistic journalism. Armed with color pencils and an eye for detail, Cortés has produced a beautiful and subversive history of how that bottle of Coke ended up in your fridge. Cortés weaves his people’s history with meticulously and gorgeously crafted drawings—many of them recreations of the primary documents he uses to tell his story. 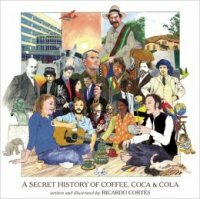 The end product is a damning, epic tale of hypocrisy: while the US government leads the charge to criminalize the 10 million people who chew coca, it has simultaneously conspired with a multinational beverage giant to ensure an endless supply of coca to fuel its profits.